Every year, on the anniversary of the first-ever post on this blog, I write a post summarising my thoughts on what’s happening in the world of Microsoft BI and what I’m up to professionally. This year, rather than go on about how Power BI is taking over the world (which we all know already), I thought it might be interesting to consider how the focus of this blog – and by implication the focus of my work – has changed over the last few years by looking at the viewing statistics of some of my most popular posts. As you probably know, for a long time the only product I cared about was Analysis Services Multidimensional and MDX: it was pretty much all I blogged about and the only thing I did consultancy and training on. The following graph shows how the number of hits on four of the most-viewed posts on this subject from 2014 to 2018: Aggregating the result of an MDX calculation using scoped assignments; Joining the results of two MDX queries together; Last Ever Non Empty – a new, fast MDX approach; and One Cube vs Multiple Cubes. None of these posts are, in technical terms, out of date but the downward trend is the same for all of them. The decline in traffic is matched by the decline in demand for consultancy and training on SSAS MD and MDX. While I still spend around 20% of my time doing SSAS MD and MDX consultancy, I do very little training on them at all these days – I guess because no-one is building new solutions using SSAS MD, although there are a still a large number of SSAS MD solutions in production that need maintenance and improvement. 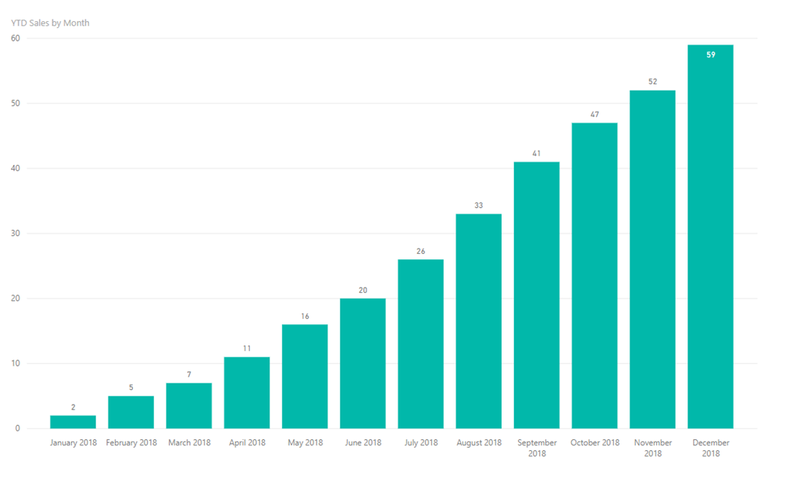 I expect the launch SSAS MD in the cloud as part of Power BI Premium will lead to a spike in the amount of work I do on it as I help my customers migrate but that will only be short-lived. 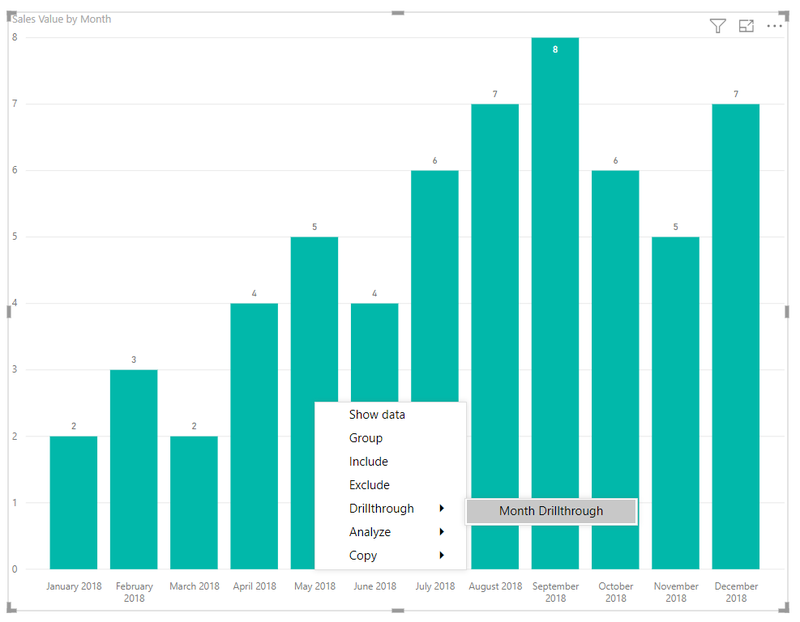 Power Query and M is a bit of a niche topic, though; right now my most popular posts are on general Power BI data modelling and DAX – a topic I don’t actually blog about all that often, but which I nevertheless spend a lot of consultancy and training time on. 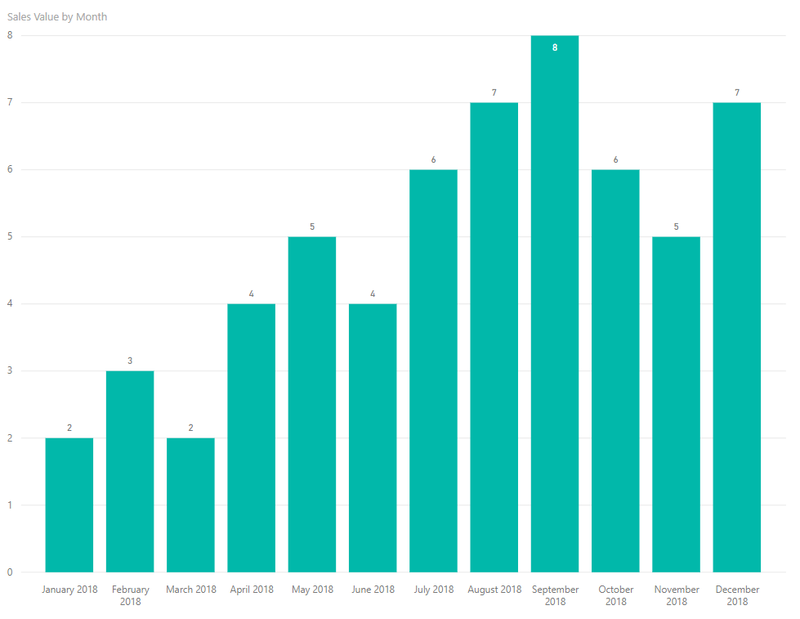 The following graph shows the trends for the posts Comments and descriptions in DAX; Creating current day, week, month and year reports in Power BI using bi-directional cross-filtering and M; Dynamic chart titles in Power BI; and (although I’ve never really understood the popularity of this one) Using DateDiff() to calculate time intervals in DAX. Perhaps I should blog about this more? The reason I don’t is twofold: first, there are a lot of people out there such as Marco and Alberto who specialise in DAX, have covered all the obvious angles and do a much better job than I ever could; second, my philosophy has always to blog about what I’m interested in and excited about, and frankly I have always enjoyed Power Query and M more than DAX. It goes to show how the “Dynamic chart titles” post is now much more popular that the “Aggregating the result of an MDX calculation” post was, even at the peak of its popularity. I guess Power BI is a safe bet for my future. Clearly there are some substantial query performance gains to be had by turning off data privacy checks and these gains are made in the Evaluating phase. In this case the queries in both Power BI Desktop and Excel were around 30% faster with data privacy checks turned off. BUT is it safe to turn off data privacy checks? I strongly advise you to read my series on data privacy settings starting here, in particular this post on disabling checks, to understand the issues involved. You should not turn off data privacy checks without understanding what they do because you may end up sending sensitive data to somewhere it shouldn’t go and maybe even break the law. 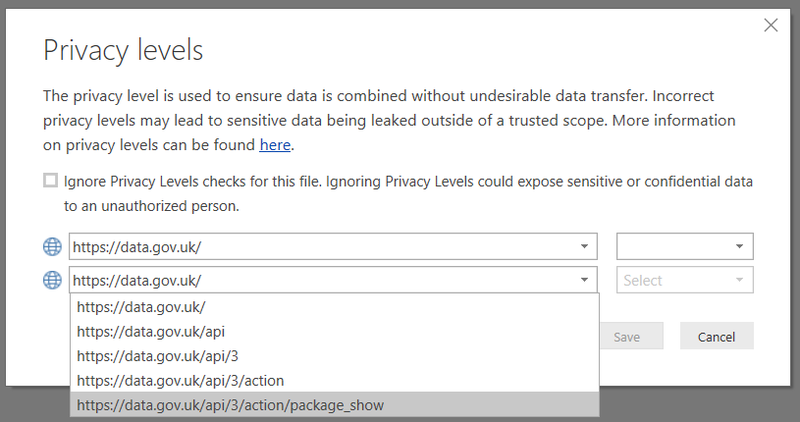 What’s more, if you have published a Power BI dataset you cannot disable data privacy checks for scheduled refresh unless you are using the gateway in Personal mode and have configured it with the “Fast Combine” option turned on, as shown here. Therefore turning off privacy checks is only really useful for Power Query users in Excel or to speed up development in Power BI Desktop. In this particular case there is only one data source, an Excel workbook, a source which does not support query folding, so as far as I can see there is no risk in turning off data privacy checks because there is no way data from this Excel workbook can be sent anywhere else. Now why couldn’t the Power Query engine work this out? When an end user sees a strange value in a Power BI report, their first reaction is usually to want to see the detail-level data from the underlying table. Power BI’s drillthrough feature is a great way of letting them do this, but it only returns meaningful results if you use it on measures that do simple aggregations such as sums or counts; if you have more complex calculations then usually what the drillthrough returns won’t be the rows that go to make up the value the user has clicked on. In this case, because the user clicked on the year-to-date value for May 2018 they would expect to see all the rows from the Sales table that went to make up that YTD value for May, that’s to say all the rows from the Sales table where the date was in the range January 2018 to May 2018. 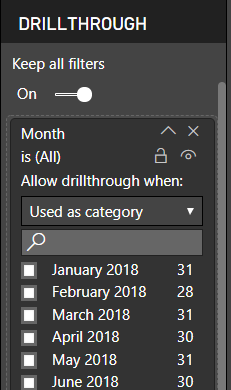 The solution is to use some DAX that takes the month filter passed by the drillthrough and ensures that it filters the table shown not by the selected month, but all months in the year-to-date (similar to, but not exactly the same as, what I describe here). 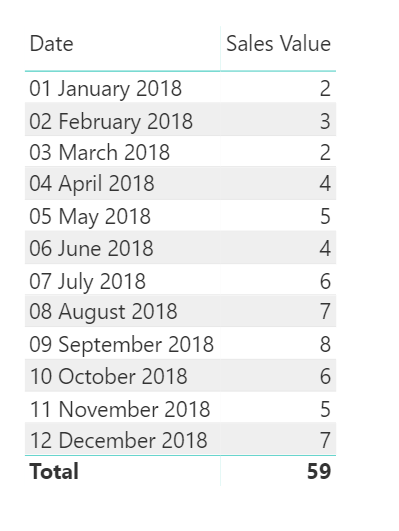 Uses the DAX Crossfilter() function to disable the relationship between the Date and Sales table, and then use the SelectedValue() function to find the date from the Sales table shown on the current row of the table on the drillthrough report page, and store it in the CurrentDateFromSales variable. 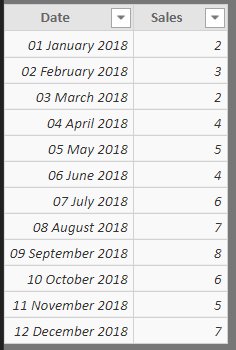 Constructs a table using the DatesYTD() function and the Date column of the Date table, which contains all of the dates from the beginning of the current year up to and including the last date in the filter context – which will be the last date in the month selected in the drillthrough. Uses the Contains() function to see if the date saved in the CurrentDateFromSales appears in the table returned in the previous step. If it does appear, return the value of the Sales Value measure. Once again, this needs to have the relationship between the Sales and Date table disabled using the CrossFilter() function. This measure can be used in the table on the drillthrough page instead of the Sales Value measure. 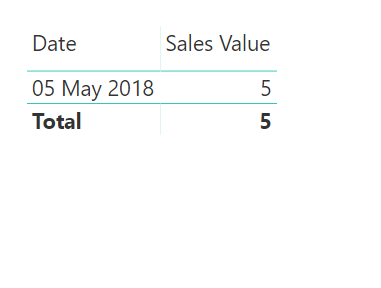 Last of all, since your users will not want to see a measure called SalesIgnoringDate in their report, you can rename the SalesIgnoringDate column on the table to Sales Value. You can download the sample pbix file here. This is just one example, and different types of calculation on your source page will require vastly different DAX measures on your drillthrough page to ensure that a meaningful set of rows is returned. The basic concepts will remain the same whatever the calculation, though: you need to create a measure that ignores the filter applied by the drillthrough and instead returns a value when you want a row to appear in your drillthrough table and returns a blank value when you don’t want a row to appear. It’s a shame that drillthrough in the SSAS Tabular sense is not available in Power BI, because being able to set a the Detail Rows Expression property on a measure in Power BI would make this problem a lot easier to solve. 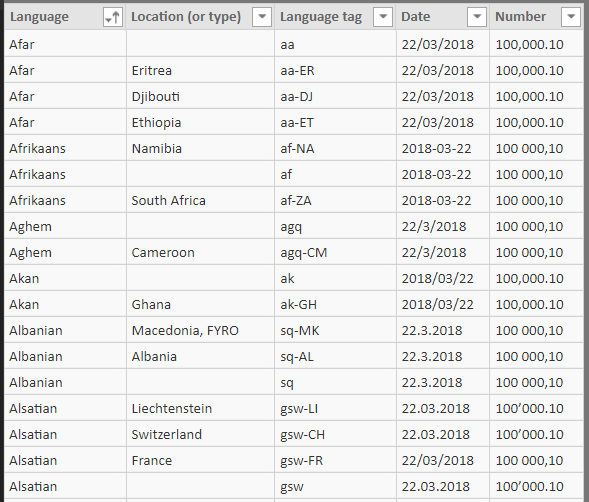 The order of the columns in a table in a Power BI dataset doesn’t matter all that much, especially because the Fields pane in Power BI Desktop ignores the original column order and lists the columns in a table in alphabetical order. However there are a few situations where it is important, for example when you are using the DAX Union() function in a calculated table: as the documentation states, when you use Union() “Columns are combined by position in their respective tables”. 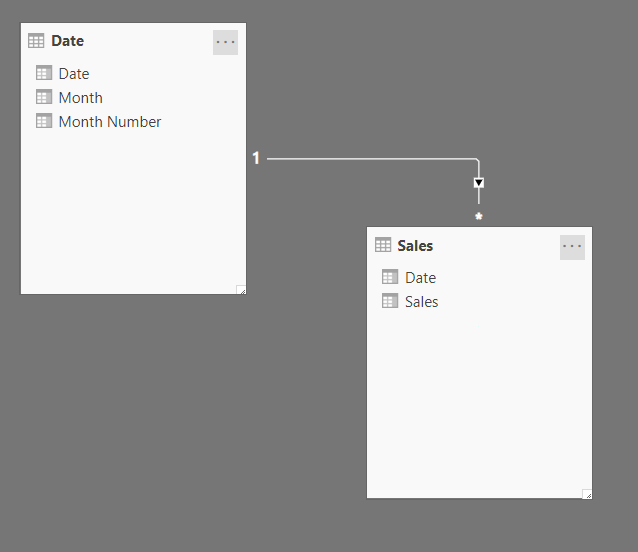 You might also find it irritating if the columns you see in the Data or Relationships panes in the main Power BI Desktop window make it hard to browse the data or create relationships. You can control the order of columns in a table in the Power Query Editor but it’s not completely straightforward to get any changes to column order you make in your queries to be applied to the order of the columns in a table after it has already been loaded into a dataset. 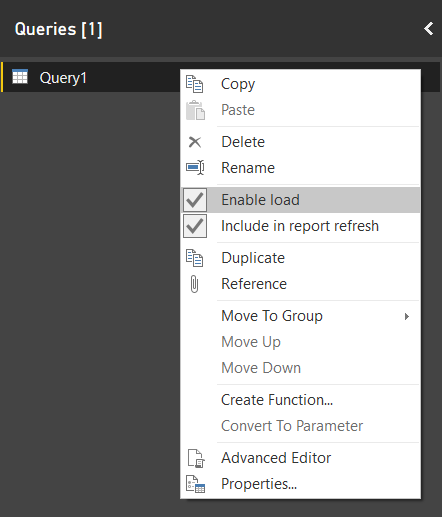 …you will find that it does not affect the order of the columns shown in the Data pane in Power BI Desktop, which are fixed in the order they were when they were first created. Sends this ID to the Package Show endpoint in the same API to get the full JSON representation of this data set. Note that the entire URL is dynamically generated and that the Query option of Web.Contents() is not used here. It’s a typical scenario where data privacy settings can cause problems: data from one data source, the package_search endpoint, is sent to another data source, the package_show endpoint. 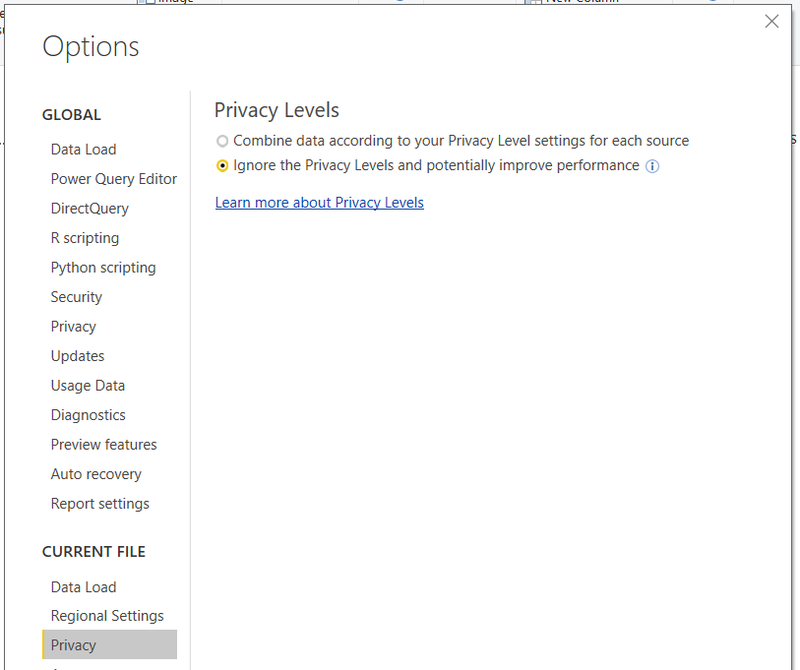 My series from last year on data privacy settings provides some useful background information on why this is such an important thing for the Power Query engine. 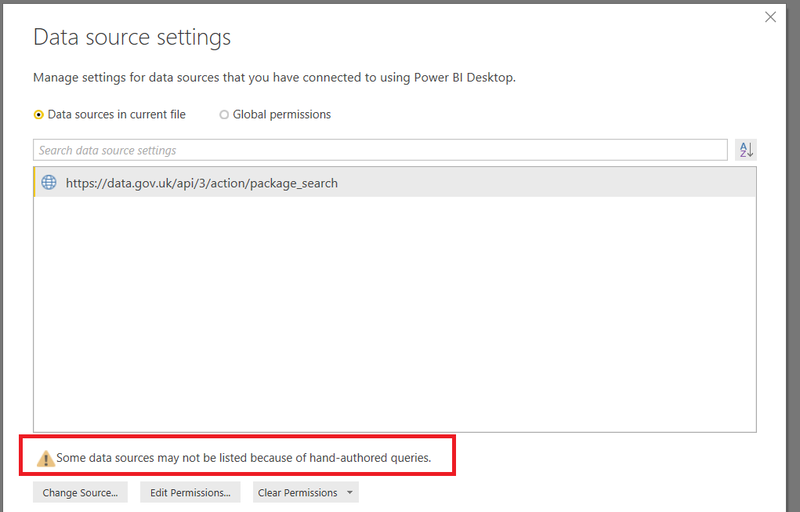 Notice that the Package Search endpoint is shown but not the Package Show endpoint. This refers to the output step in the query that calls the Package Show endpoint with the dynamically-generated url. Closing this dialog and going back to the Query Editor, if you click the Edit Credentials button, you can set credentials for the data source (anonymous access is fine in this case). 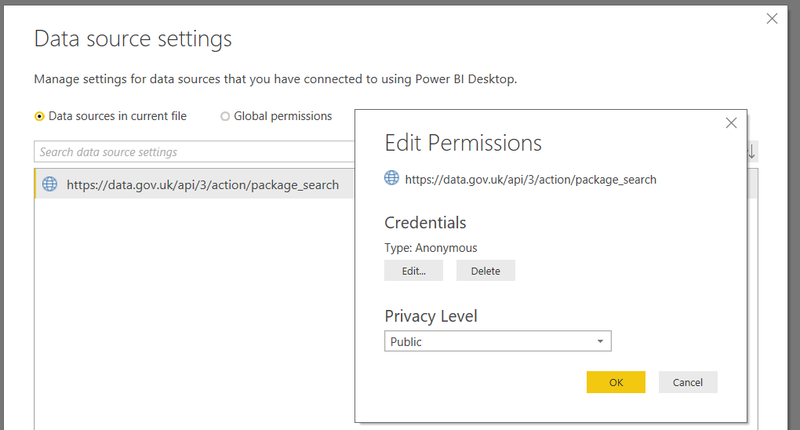 These credentials can be set at all levels in the path down to https://data.gov.uk/api/3/action/package_search. Assuming you set credentials at the level of https://data.gov.uk and click Connect, then Fiddler shows that a call is made to https://data.gov.uk/api/3/action/package_search?q=cows, presumably to check whether the credentials entered actually work and you move back to the Query Editor. You have the choice to ignore privacy levels for this file, but of course you should always try to avoid doing that. You also have two dropdown boxes that both show https://data.gov.uk on the left-hand side and another two dropdown boxes next to them, although only the top one of these is enabled. 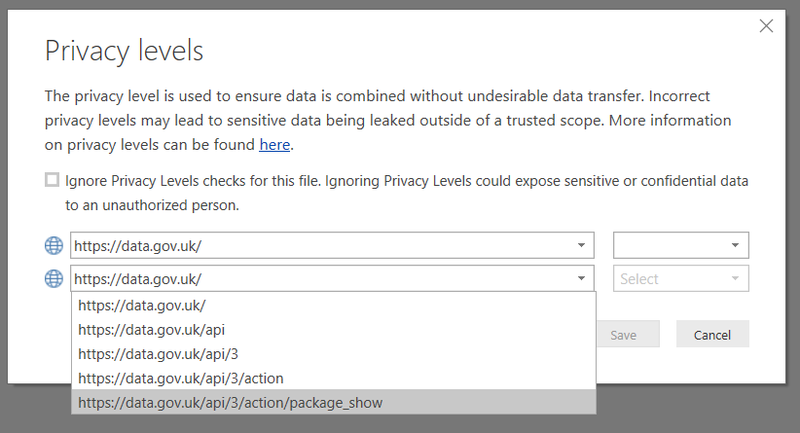 If you select https://data.gov.uk in the top-left dropdown only the top-right dropdown is enabled, and in the top-right dropdown you can set the data privacy levels Public, Organizational and Private. The meanings of these three levels are described in my earlier series and here, and I won’t go into detail about what they mean in this post. The bottom-right dropdown is disabled because if you set privacy levels for https://data.gov.uk then all urls that start with this path inherit this setting. This is similar to what happens with the None data privacy setting that I describe here, I think. 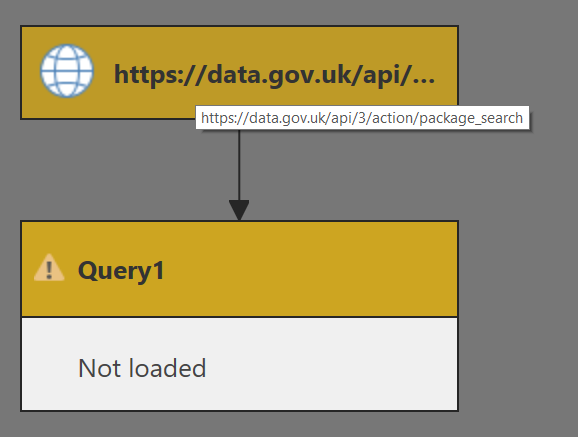 From my point of view, this is the first really interesting finding: the two endpoints, https://data.gov.uk/api/3/action/package_search and https://data.gov.uk/api/3/action/package_show, are considered as separate data sources (which tallies with what is shown in the Query Dependencies view) even though they have both inherited their data privacy level setting from https://data.gov.uk. Since they are both Private then data cannot be sent from one source to the other, hence the error. It looks like whatever method it is that the Power Query engine searches for data sources inside a query is confused by dynamically generated urls – which might also explain why data sources that use dynamic urls can’t be refreshed after publishing. The top 5 tools acquired by respondents were Power BI, Excel, Qlikview, Tableau and SSRS in that order – so Microsoft has three of the top 5 most popular BI tools. 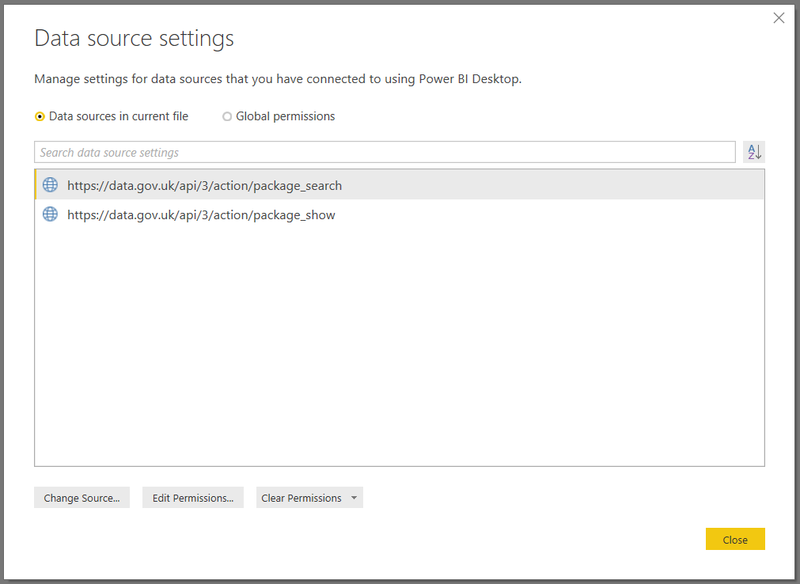 Given that users often have trouble understanding the different types of BI that Power BI, Excel and SSRS are suited to, Microsoft’s long-standing strategy of close ties between Power BI and Excel and the forthcoming integration of SSRS reports into Power BI Premium looks very wise. Power BI has – unsurprisingly – one of the best price-to-value ratios reported of all BI tools. The flip side of this is that customers are less happy with the level of support that Microsoft offers; I guess this is all relative to more expensive BI tools which need armies of people from the vendor or from a BI consultancy to implement them, and who are more likely to bend over backwards for their customers. Power BI is now the number two client tool used for SSAS after SSRS, beating Excel. I find that hard to believe but I guess it’s possible. Compared to its obvious competitors, and indeed to all other BI tools, Power BI gets some very good scores. There is no clear leader (and if there was, I would be very suspicious about the survey’s methodology) but it’s clear that Microsoft is now one of the leading BI vendors and given that it’s sustaining the levels of investment that brought it to this position, I think it Power BI will continue to grow and prosper in 2019.